Announcements > Are all your devices slowing down your Internet speed? Are all your devices slowing down your Internet speed? Having all your devices connected to a basic Internet connection can really inhibit your online activities. Recently, studies have shown that U.S. homes have an average of 6 devices connected to the Internet. Consider how many devices you have in your home using your Internet connection. For example, how many smart phones, entertainment devices like Xbox and WiiU, iPads, Kindles, Smart TVs, and streaming media players do you have connected to your Internet regularly? After considering your family’s usage, also consider the usage of your children’s friends and house guests. 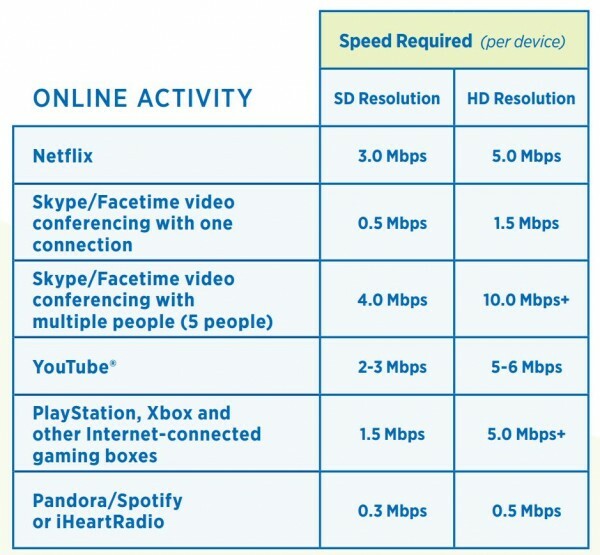 Now that the devices are really adding up, do you know how much of your Internet speeds they are using at one time? Most people are surprised by the amount of bandwith required to power all of today’s connected devices and the demand is growing exponentially. If your home’s Internet connection was a 5 lane highway with 5 Mbps, each lane would carry 1 Mbps. According to the chart, a program that takes 2 Mbps of Internet space takes up multiple lanes of your highway, making your device a wide load. Furthermore, if you have 3 devices actively using 2 Mbps, it will take 6 lanes, and that’s one more lane than your 5 lane highway provides. So, you will have to switch off, sharing your speed, causing an Internet traffic jam. You will still get your information, just at a much slower pace. In a full home with a lot of devices, your speeds can add up quickly. If your Internet connection is lagging, take notice of how many devices are connected. While you can disconnect many devices, the digital world we live in doesn’t always allow for that. Consider super-sizing your Alpine Internet service if you are streaming media sites like Netflix, Hulu, Amazon Instant Video, or Vudu. That way, you won’t have to wait while the movie loads, or buffers, and can enjoy higher-definition video. For additional information on broadband speeds, click here, or call us at (563) 245-4000.